It is here at last! The 4.12.2m compatible version of the SAS Engine Mod. Along with bring a host of new features, this version consolidates the previous works and fixes a huge amount of stability issues. We intend for this pack to form a core part of our future works here at SAS. Also included with this is a test of the SAS 10.5 buttons which enables some of the new features in this pack (and stops jet overheating). 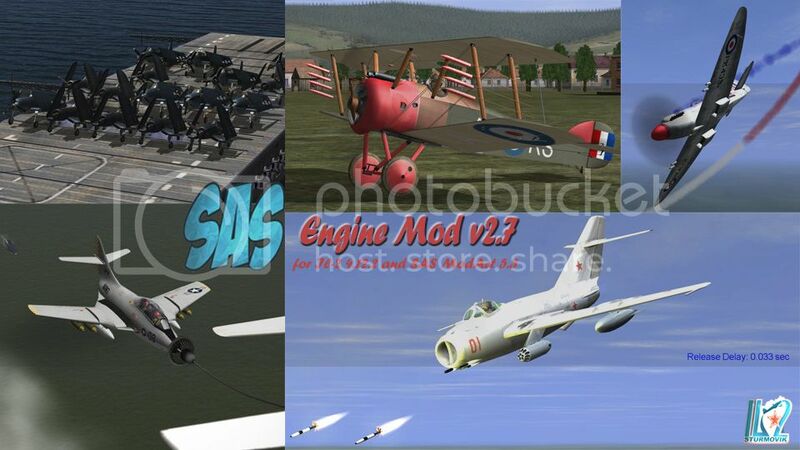 This is not a mod per say, instead this is a collection of over a dozen related mods which alter engine behavior, add additional hotkeys, new aircraft features and most of all, tweak the default AI routines. For a while, many of these mods weren’t compatible with each other as they all used the same core class files. This compilation has taken away that difficulty and combined them all in one, easy to use pack. Now in its second major release with inclusion of 1956 ‘The Jet Era’ features, the SAS Engine Mod is designed to work with SAS ModAct (and hopefully the future DBW update) and to help achieve the dream of a unified modding code base. For the end-user, it means expansion of core games features and access to new elements such as air-to-air refueling, fuel dumping, realistic engine startup, carrier operations and even radar and modern electronic warfare. It significantly alters what you can do in Il-2 and really acts as the ‘engine’ behind all of SAS’s major mod packs. Hence why we have decided rename this pack as the ‘SAS Engine’ mod. It is a continual work in progress and is be updated to allow for new features. Currently version 2.7 is only compatible with 4.12.2m but compatibility may be expanded later. - Additional aircraft controls - blown flaps, drag chutes, radar, variable incidence wings, fuel dumping, missile selection etc. *NB* Comprehensive readme included in download. Many of the features have been tested extensively offline however the experience may vary online. 3. *OPTIONAL* Find and locate your 'buttons' file (usually found in #SAS/STD/gui/game). Replace it with the 10.5 buttons tester. This will enable some additional features for many aircraft and will eliminate the overheating bug for most jets. - Special thanks to SAS~Storebror for his patience and troubleshooting. Without him guiding me, this compilation and many of its features wouldn’t be here. Very Cool, Congrats Anto, and SAS!!! Thank You! YAY! Thank you, Anto! When I read it felt like a Christmas is already here! I have to say while the 4.12.x code is still buggy for fast jet speeds around and above sub sonic, the Mig-21s are more fun and smoother in 4.12.2. Look forward to you guys seeing that. Congratulations to the creators of this mod! Apart from the Jets (which have likely been most demanded in the recent past for 4.12.x) this mod brings so many great features, it should be treated mandatory for any further mod collection. Concerning transsonic speed handling, yes there's still room left for improvements but bear with the creators of this mod, it's been some hard work to get around the TD implementation of mach drag which still is extremely cryptic and (deliberately or carelessly) totally undocumented. Good times ahead, thank you very much! Congratulation for the official release of your MASTERPIECE!!! Mike, I mainly meant even with some minor limitations, the basic jet handling in 4.12.2 is more fun! So thanks to Anto and all involved, great to have this mod, IMHO the most important outside my other passion HistoMod, back in. It'll load & fly but with no weps, even w/ the optional F4 weps package.